Welcome to BLaST Intermediate Unit 17. We are a group of educators and staff that are passionate about supporting the public and private schools in Bradford, Lycoming, Sullivan, and Tioga counties. Take a look around and get to known us. BLaST assists regional schools with their charge to educate special needs children. Additionally, we are fully engaged in assisting schools with their regular education curriculum and professional development needs. We also provide business management and many technology services all with the goal of reaching our mission of 250,000 thinkers. We provide services for students, parents, communities, schools, and teachers. We envision 250,000 “Thinkers”. Thinking is foundational to the development of self and society. It is the cornerstone of all creative ideas and problem solving, new scientific discoveries, new products and services, individual and organizational learning, education, business success, interpersonal communications, social change, and democracy. 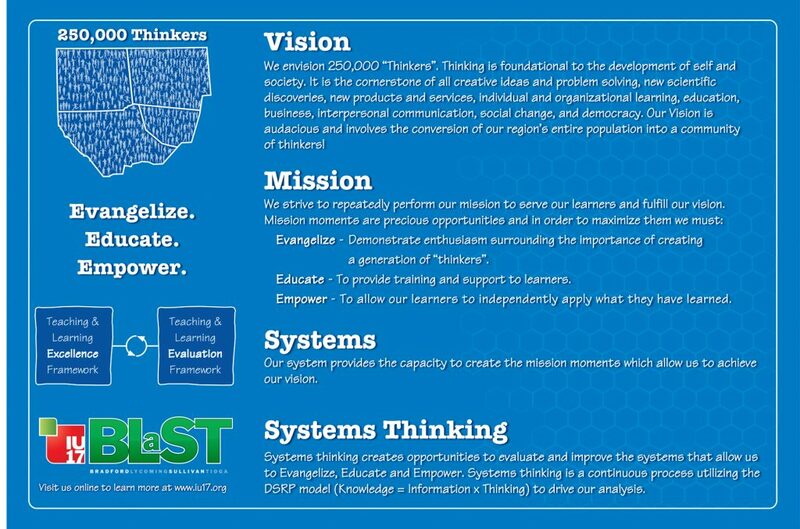 Our Vision is audacious and involves the conversion of our region’s entire population into a community of thinkers! Educate – To provide training and support to learners. Engage – demonstrate enthusiasm surrounding the importance of creating a generation of “thinkers”. Empower – To allow our learners to independently apply what they have learned.